And Another Thing...: This Guy! PNB corps de ballet member Dylan Wald in "The Calling"
Pacific Northwest Ballet could have called its November 2015 program ‘Emergence of Dylan Wald’ instead of "Emergence." 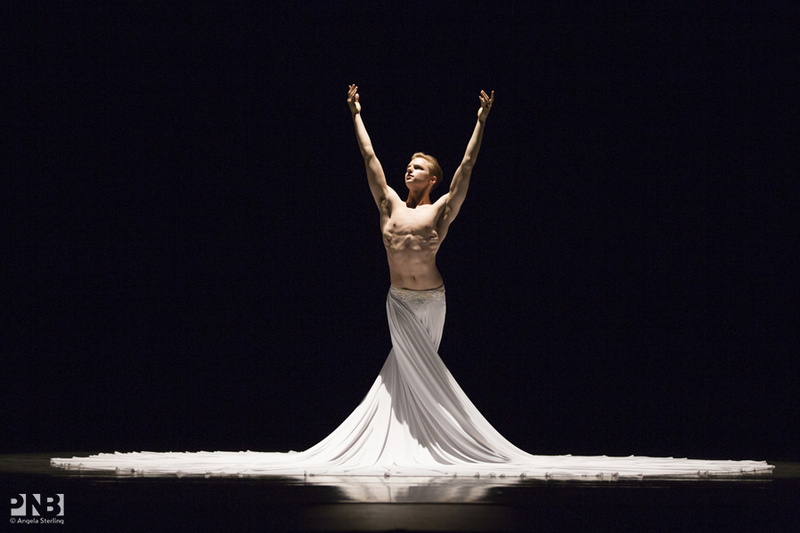 When the curtain rose on the 19 year old corps de ballet member, alone at the center of the stage, draped in the voluminous white skirt that is his only partner for Jessica Lang’s spell-binding dance, “The Calling,” you could feel thousands of audience members inhale in anticipation. I’d been hearing about this young dancer for several months. Throughout the PNB offices and rehearsal studios, company employees pointed to Wald as “one to watch.” This season is his first as a full-fledged company member; he was an apprentice dancer last year. Watching him side by side with principal dancer Jerome Tisserand in this program, I could easily envision Wald the equal to Tisserand as Romeo, or Giselle’s Albrecht. 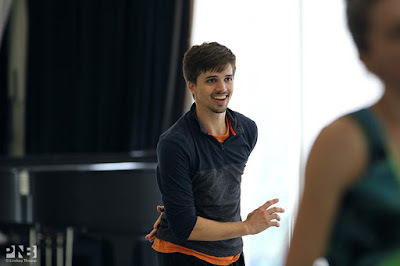 And that’s saying a lot, because Jerome Tisserand is one of my favorite dancers. PNB premiered “The Calling” last June; Carla Korbes danced it in her final performance with the company. It was exquisite then, and it was exquisite this time around. One of my friends remarked that Wald is the new Carla Korbes. One can only hope. Dylan Wald is certainly not the only PNB corps de ballet member to shine in this four-ballet program. While the ballet features stellar performances from its large cast, and establishes Suddarth as a promising dancemaker, the piece didn’t quite gel for me as a whole. Most interesting were Suddarth’s sections for the men. Corps members Wald, Kyle Davis and Ezra Thomson were as compelling as principals Tisserand, Karel Cruz and Batkhurel Bold. Corps members Chelsea Adomaitis and Angelica Generosa were among the dancers featured in Kiyon Gaines’ “Sum Stravinsky.” I love how Adomaitis moves with her heart on her sleeve, or rather, on the straps of her tutu. And Generosa is always a multi-faceted gem of a dancer. PNB Principal Dancers Karel Cruz and Laura Tisserand in Price Suddarth's "Signature"
Soloists and principals were also spot-on Friday evening. Maria Chapman was all tensile strength and grace; Laura Tisserand was ferocious in “Emergence,” and Margaret Mullin was a phenomenon as the hatching insect in that same ballet. PNB Principal Dancer Maria Chapman in Kiyon Gaines' "Sum Stravinsky"
But for me, this program was all about the younger dancers, and the promise they hold for Pacific Northwest Ballet’s future. I can’t wait to see Suddarth, Adomaitis, Davis and Generosa again. And I’ll be watching for Dylan Wald’s next appearance. You should, too. This place has the most perfect environment, great food, tasty wings, lots of good beer, but best of all - probably the best wait staff in all of country. Visited venues in Houston last month again, had another great time.